When it comes to snacking, I'm always on the lookout for products that combine three important factors: healthy, tasty and portable. After all, between school, sports, lessons, activities, friends, appointments and more, being able to pull something out of my bag for the kids and I to munch on can often be a lifesaver. Although I would like to say that those items that I pull out meet my three criteria... that's not always the case. Even if I mean well, I find that what constitutes an on-the-go snack can sometimes cross the line over into unhealthy treats that are better off left at home. Therefore, when I was introduced to PROBAR and the way that their meal bars are made from whole, organic, 100% vegan, raw foods, my interest was peaked. Then, after hearing that PROBAR had taken their commitment to convenient, natural, high-performance nutrition and went one step further by creating gluten-free products, I knew it was time to try these for ourselves. 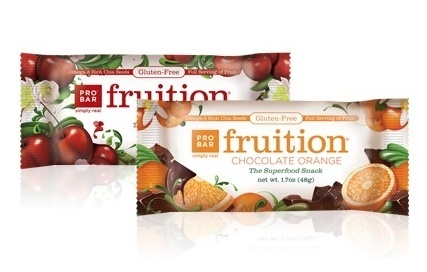 A natural alternative with easy to pronounce ingredients and a variety of flavors, PROBAR's new Fruition bars are the first certified gluten-free product in their lineup. These fruit-dense, superfood snack bars deliver one serving of fruit in every bar, are built from a 100% vegan, organic, non-GMO, gluten-free medley of dates, oats, chia seeds, and cashews, and contain only around 160 calories. When a selection of the seven flavors of Fruition arrived, the hardest decision was figuring out which to sink my teeth into first! Available in Blueberry, Cherry, Cran-Raspberry, Peach, Lemon, Strawberry and Chocolate Orange, I unwrapped a Peach and was impressed with the thick texture and the way that I could see the amount of fruit, dates, seeds and more right inside. As each bite results in a dense, slightly sticky, extremely tasty result, it didn't take long before I felt as though I was a little hooked on Fruition. After all, the texture is balanced, the flavors are delicious, and I felt satisfied at the end of the bar knowing that I wouldn't be immediately hungry 10 minutes later! 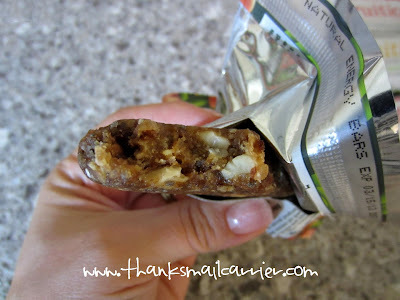 While the Fruition bars immediately met my criteria for a go-to snack (on-the-go or at home), I knew that the true test would be with my kids and if they were as excited to find the PROBAR packaging awaiting them as I was. Even though they seemed somewhat skeptical at first, the initial taste test (and those that followed) was a success! 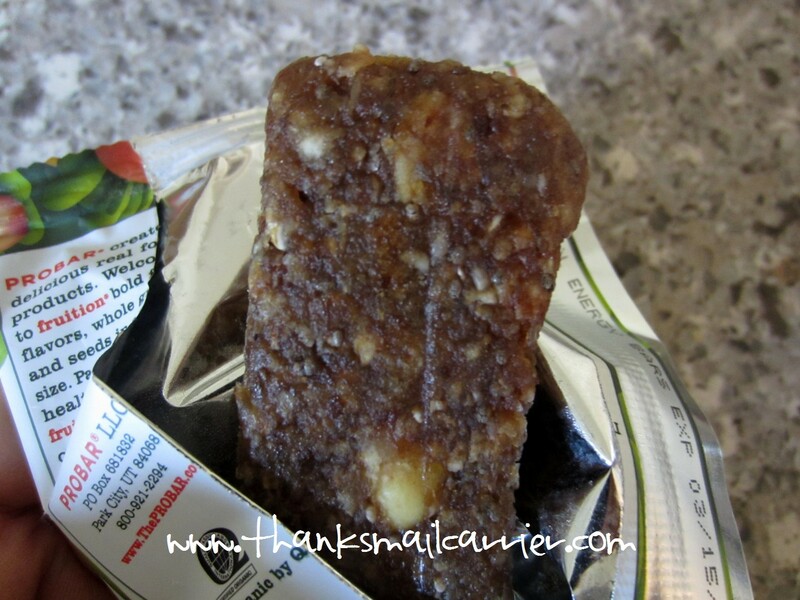 Considering that we are all new PROBAR fans around here, I'm looking forward to adding Fruition to our regular rotation of snacks and knowing that they will provide my family with the healthy goodness that they need and the delicious taste that they desire. Instead of feeling guilty pulling out a food that is packed with processed ingredients that I can't pronounce, I'll know that these are simply natural! 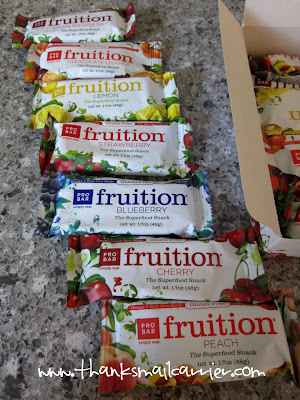 Retailing for around $1.79 per bar or $18 per box of 12, Fruition are available in store near you or online directly from PROBAR. Even better, right now if you enter the coupon code BLOGGER at checkout from the PROBAR Shop, you'll receive 40% off of your first order! Considering a box of 12 is currently on sale for $16.63, that discount will bring it down to less than $10! 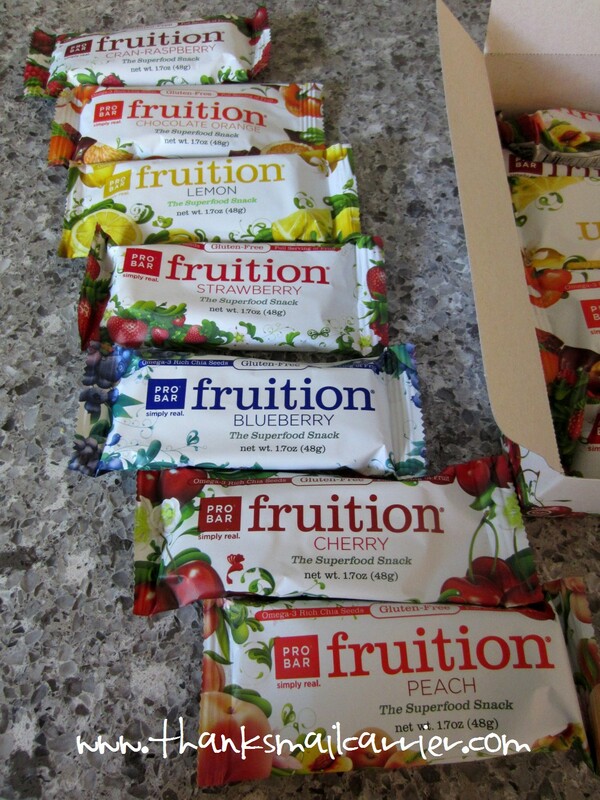 One lucky person will win a box of 12 Fruition bars from PROBAR! A big thank you to PROBAR for providing Fruition bars for me to review as well as for one lucky giveaway winner. 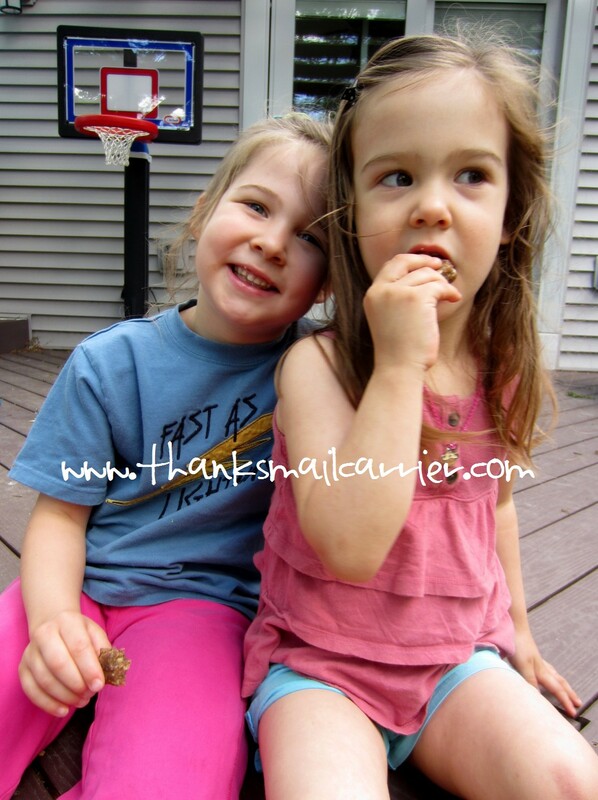 The opinions shared are my own and honest and if you really need to see more, click here to see how I roll. Most excited to try the Cherry flavored bar! Hmmm...Chocolate Orange sounds interesting! Thanks for the giveaway! I would most like to try the Peach flavor! i'm most interested in trying the peach flavor! I would most love to try the chocolate orange flavor! Blueberry sounds like a would be family favorite. lemon sounds good to me! I want to try cherry. I want to try the cherry! I want to try the Peach one. I love my chocolate so I would like to try Chocolate orange. I would love to try the lemon. They look delicious. I'd love to try the peach bar. I would try them all but the orange sounds most interesting. This Gramma would really love to try the Cran-rasberry ones... I'm crazy over each of those fruits. I would like to try the cran raspberry. I like to try the peach. I'd love to try the chocolate orange version - yummy and healthy! Curious, would like to try the Lemon flavor. Cherry sounds lovely! I would love to try that one! I really want to try the blueberry! I want to try the cran-raspberry flavor! I would most like to try the Cran-Raspberry flavor. I am a fan of the flavor Blueberry.. I'd like to try the blueberry! I would choose peach. Thank you for the lovely giveaway! I wanna try the strawberry! I really want to try peach. Thanks for the giveaway...we would like to try the "Cran-Raspberry".